Witch Hunts. They still happen today. The witch hunts that took place from 1480 to 1700 were in part facilitated by the negative perceptions of women during the time period of their occurrence. Statistics reveal that females typically comprised about 80% of the total amount of “witches” executed, implying that, for every male victim (and how many of them were homosexuals? ), four females lost their lives. Writing ‘The Hammer of Witches (Malleus Maleficarum)’,the monks Heinrich Kramer and Jacob Sprenger entrenched this misogynist bent into official witch-hunting doctrine. Kramer and Sprenger describe a woman as inherently more fallible than her male counterpart, and from her very nature, as one originating from an improperly bent rib, prone to evil. However, Kramer and Sprenger also write that, though women are susceptible to evil influences, they can also be “very good” when they use their impressionable qualities in a certain manner. Women like Alice Prabury, who diverged from the expected role of a woman as a mundane housekeeper and instead obtained uncommon skills to cure people and animals of diseases, were targets for persecution. The Churchwardens of Gloucestershire may have filed their accusation of witchcraft against Prabury due to their disapproval of the excessive independence that the woman manifested, as exemplified in her refusal to tell others, including the representatives of the dominant paradigm, the unique means by which she went about performing her work. Thus creative, individualistic, and independent women were most often the targets of the two-century-long spree of witch hunts. Such persecution unfortunately destroyed many talented individuals who could have lived fulfilling lives and made tremendous advances in the arts and sciences. Now, cast your minds back to the campaign of vilification that was unleashed by the Liberal Party against Julia Gillard, the lawful Prime Minister of Australia. How well-read is our own Mad Monk in the Catholic Canon? How have his perceptions of women in contemporary society been informed by what he has learnt during his years of education as a Jesuit, both at school and in the Seminary, while he was there? How has his own misogynist bent been used to inform the campaign of abuse, humiliation and vilification against Prime Minister Julia Gillard? An openly proud Atheist and Non-Conformist to the social doctrines that Tony Abbott is steeped in? Now, of course, when Tony Abbott is accused of being a misogynist towards the Prime Minister, people spring to his defence by saying, “Look how well he gets on with his wife and daughters. Look at his Chief-Of-Staff. She is a woman! They are powerful women. He’s obviously OK with powerful women. Your accusations have no substance!” However, I put that down to a differential perspective. 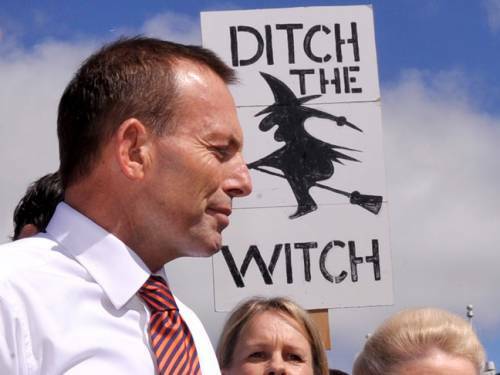 In Abbott’s eyes, as quoted above from ‘The Hammer of Witches’, ‘good women’ are those who behave in ways that receive approval from men, conform to the ‘Male as Dominant’ paradigm and the social and religious conformity expected of them by religious males. That is, these women are married, or single young women on the pathway to marriage, and thus conform to Tony Abbott’s idea of what a good woman is. Hence he is happy to treat them favourably. Why wouldn’t he? As people say about him, he is basically a decent person when around the people in his social milieu. Who get the tick of approval from him. Of course, I must single out Julie Bishop for special mention here. She may not be married to her partner Peter Nattrass, or have produced any children. Also has been as career-driven as the Prime Minister was; however, she conforms in as much as she knows her place in the Tony Abbott Coalition hierarchy, and that place is as a submissive woman to ‘The Leader’. Also, how can we know what Tony Abbott’s innermost thoughts are about her? Nevertheless, Ms Bishop has not become dominant over Mr Abbott, so is not in the same category as the Prime Minister. So, the woman who does not conform and has broken the mould, is thought to have succumbed to evil influences. Therefore is a witch and a justifiable target for persecution, in the mind of a devoutly religious man. It certainly serves as a philosophical justification, if nothing else, and a salve to any sort of a guilty conscience Tony Abbott might have felt, if only initially and long since passed, as he began his public attacks on a woman with verbal violence of a ferocity never before witnessed in Australian politics. In fact, I’m hard pressed to think of any other female leader of a country or political party who has been so publicly demeaned by her male political opponent, as has Julia Gillard. Without remorse and relentlessly. Junius = Julia? It’s not as ridiculous a proposition as it may at first seem. Of course, an actual death is not possible. However, a political death is an eminently desirable outcome for the protagonists in our political game. And not beyond the realms of possibility, as a perfectly justifiable game plan, for our own Mad Monk. after all that’s all we want both sides of the story.,. tweeters , tweet scott and suggest he take a look at the guardian or do his own investigating. Remember there is a book coming out soon re the Stalking of Julia by Kerri Anne Walsh. Remember what happened to the book by Christine Wallace on PMJG a few years back? The rumour was that Rudd paid her not to release the book as it detailed stuff detrimental to him. I wonder What is going to hapoen this time. CK Watt if you are around do you wish to do the raffle tonight? Rob is still getting things done in Lyne. The latest, announced just this week, is $1 million federal funding through the Regional Development Fund to build a regional operations and training centre in Port Macquarie for Surf Life Saving NSW. i’ve lost track of how many $millions Rob has won for this electorate in the last three years. And that’s without all he did before that. He still hasn’t announced whether he’s running again or not. Today he tweeted that some Liberals who had had too much to drink had told him that National polling showed they were behind in Lyne. I hope that’s true and I hope it encourages him to have one more run. slav g and billie, returning to that comments column it looks to me like many have been restored (not retained, billie, mine definitely was not there in the small hours (wa time here midnight) because I went back twice, thinking it might be a timing factor. But no, there were several before and after mine which was definitely not there. Someone senior has put their oar in, I think. The sentiment of response is now overwhelmingly critical and expressing disappointment at the lack of good reporting or at least a different take expected from the Guardian than we have here in the old murdoch/fairfax media echo chamber. There’s a similar strain to the jihadist terrorist story, Such profound appreciation expressed for the decent report in that really good read. Surely if we keep it up it’ll have some impact? @KRuddMP is heckled in Geelong. His presser interrupted by people calling for his return as PM. With enemies like that, who needs friends? What was Rudd doing in Geelong anyway? Rudd is a nobody, he’s not a minister, so why the royal progress through Geelong? I don’t see other back benchers touring interstate electorates. Rudd should keep his campaigning to Queensland and leave the other states to the relevant MPS. Nope. i want a proper answer. [The Melbourne talks will be chaired by Industry Minister Greg Combet this afternoon. I have a view about Rudd which is well known. Therefore he is doing exactly what I expected him to do. I hadn’t heard that about a book on Rudd not being published. Any more details? At the time this article was linked via twitte by Sam Maiden with a picture of PMJG wearing one of those Russian Looking fur hats. Claims Egyptian asylum seeker is being victimised by AFP and the opposition with selective leaking of damaging material. As jaycee mentioned previously, what the heck is the AFP up to? Rudd is probably in Geelong because Corangamite is held by Darren Cheeseman, and he generally helps campaign for his supporters in marginal seats. is vicy on the money.